The former lake, now a swamp. at the sources of the ru de ras Virgines (the Virgins' Brook), near the road that climbs to the Dibona Hut at the feet of the Tofane, enjoys a magnificent view over the Croda da Lago (Lake's Peak), situated due South. 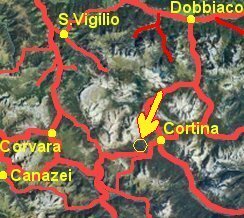 The Ru de ras Virgines, that flows into the rio Costeana under the road to the Giau pass just upstream of the fork between the Falzarego and Giau passes, has its source from a small lake, today a swamp, near the Fedarola stables (m 1750). A part of the waters is intercepted by a small aqueduct. The anguane of the rio delle Vergini are first mentioned - as a hybrid between normal women and "water spirits" - in the Merisana's sun myth, where she marries - at high noon - the rey de rayes (king of rays). Since at noon the sun, as seen from the lake, is exactly on the perpendicular of the Lake's Peak, we can start understanding the nature of the mystical bonds connecting the lake's water, the Sun and the mountain. In the Fanes' saga, Ey-de-Net climbs mount Amariana (= of Merijana, i.e. Merisana); a mount that is told to be sacred. Later, the hero meets an anguana in the Costeana valley. It shouldn't be a hazard supposing that this anguana too is connected with the ru de ras Virgines. Excursions: driving from Pocol up to the Falzarego pass, shortly after km 114 ( m 1698) a road forks to the right: closed to non-authorized traffic, it climbs up to the Dibona hut m 2683. In a few minutes of walk along the road, the Fedarola stables can be reached, just below which the small swamp is located. The Dibona hut is an excellent support point for further excursions in the Tofane group.